On July 27, 2018, a group of strangers gathered in the warmth of the Microsoft Reactor space in the heart of San Francisco. The mission was simple, bring students, educators and developers together in order to address common problems in education. Simple, but not easy. 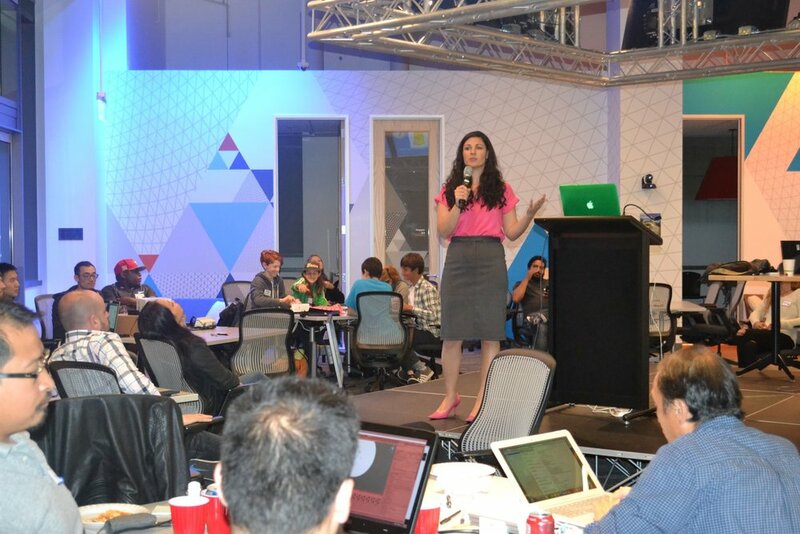 Azine Davoudzadeh, the organizer of XR Edu Challengeand founder of XR Edu, graciously hosted as she welcomed two amazing speakers with ground-breaking virtual reality applications that are sure to change the landscape of education in the near future. Jens Zalzala founder of Shaking Earth Digital, took the stage with his uplifting demeanor and inventive humor. Zalzala explained the mission of Shaking Earth Digital. Jens and his team develop mobile apps that feel natural to use and puts a focus on user engagement. Their goal is to bring ideas to life, to make them vibrant, innovative, and intuitive for students. He also likes to share his enthusiasm for coding and technology with others and works often with local schools to encourage students to work in the STEAM fields. Zalzala spoke about schools that are challenged to build computer science programs which are inclusive. Currently, it is estimated that only 20% of females are enrolled in C.S. courses. In order to gain the diversity within these fields, Jens created a VR application where students can learn to code with visual blocks within VR. This engaging and fun way to learn coding, will attract more diverse populations. Clorama Dorvilias, CEO and founder of Debias VR, stood up and delivered her fierce talk on what the recent state of biases are within classrooms. Subconsciously, teachers may be projecting their implicit biases on their pedagogical practices. Her VR application, Teachers Lens, uses the Harvard researched implicit bias test in order to make the user aware of their current biases. Knowing the results of this test, may be a hard pill to swallow for most but a necessary one. How can change occur without knowing where you currently are? The application offers teachers not only tests to see where they stand but also training on how to overcome any bias that they may currently hold. It examines two areas; racial and gender biases. Teacher’s Lens is friendly and approachable as you call upon animated students within a colorful classroom setting. You will walk away feeling like you learned something important for your teaching practice. Clorama eloquently stated that we have all experienced micro-aggression's (casual degradation of a marginalized group) and stereotypes, such as thinking a woman wearing a head scarf could not be from Canada. One could see the audience stirring with thought over these ideas. Once the group shared their names, roles, and ideas they dispersed around the room to look for potential team mates. Heated and passionate discussion ensued as they discussed these pertinent questions. Bright and early the next day teams clamored to get to work after having a night to brainstorm their ideas. Keyboards clicked throughout the long day as groups began engaging in the development of their projects. Coffee was sipped as the song, “Eye of the Tiger” blared throughout the room to get everyone pumped for their final day. Deadline 2 pm. Our diverse and talented judges thoughtfully examined the projects as each team presented their solutions. The judges team consisted of Chris Chin, Executive Director of VR Content at HTC Vive, Diane Pawar, Ph.D. of ImmersED2018, Kieran Farr, VP of Marketing at Bitmovin and XR Edu’s design intern, Aylin Delacruz. Judges try Chem EQ Sim’s application before making their final decisions. VRama: Bee Mattox, Sam Woodard, and Reuben Lewis and Seamus Kenna. Team VRama wanted to make something that students could use to create in VR to help them understand and think about topics. VRama allows you to create life-sized dioramas. Students can use this application to research the topics they are creating, which helps them have a deeper understanding of the subjects. To take it further, this team envisions more functionality — such as; manipulating objects, instantly adding assets via cloud drive, and being able to animate objects and scenes. 2. Raindrop: Anglelo Hizon, Neilda Pacquing, Kaochoy Saetern and Sierra Plumb. In the middle school classrooms’ students have trouble connecting changes in Earth’s surface to events over time. TopoTrainer enhances student learning in reading topo maps. However, the real accomplishment is allowing student interaction to adjust and create their own topographic maps. Students can then play creator as they deposit rain, a critical life source for all life. This rain then collects in watersheds, affecting ecosystems. Next steps for student engagement would be the influence of human activities. Students could construct, build roads, migration of species and other activities that increase the amount of erosion flowing through the watershed. This increased erosion can negatively impact the health of lakes and streams. Climate change is expected to reduce the snow pack in many mountain regions. This would decrease the flow rate of rivers, which would reduce erosion rates and the timing of deposition. 3. Kudos: Micah Zayner, Miles Fleisher and Troy Allen Norcross. Biohack VRwas inspired by Micah’s work with high school and college level communities who are teaching genetic engineering with his brother’s company The ODIN. They deliver a science experiment kit that is not very engaging to watch bacteria grow. This experience helps students visualize the process of bacterial growth and will create more interest in genetic engineering. Biohack VR is a designed experiment that takes the user through a normal lab experiment using CRISPR Cas-9 gene editing techniques. 4. Invent XR: Priyanka, Banerjee, Sheridan Tatsuno and Freedom Cheteni.Many teachers are not familiar with XR. InventXR allows a hassle-free first look into the world of XR, especially VR. They created a social website where anyone can post instructional videos for others to learn about the newest tech, making the website user-friendly and easy to access. 5. Elements of Surprise: Andy Shih, René Diaz, Andy Albani, Sean Darsie and Christine Mytko. Chem EQ Sim 2018 gives players a selection of equations describing a common chemical reaction — in each round, a specific equation is selected. Players pull molecules from the right (reactants) side of the equation, then free the component atoms by breaking the bonds connecting them. The atoms, thus freed, can be dragged and recombined into new molecules on the left (products) side of the equation. Each round of play ends when there are an equal number of each type of atom on each side of the equation. 6. Wakanda ForeVR: Michael Taylor, Jens Zalzala, and Elan Bustos. Solar System Simulator was created to get people interested in the solar system, space, gravity, and other topics related to astrophysics. It is built with SteamVR and Unity and was developed on Windows Mixed Reality. If you would like to check out specific details about the projects visit: devpost. Looking ahead XR EDU hopes to be able to harness the momentum of these projects to inspire these teams to fully build out their applications. Then they can utilize the teacher contributor on each team to test it within their respective classrooms. In turn collecting data and research on the effectiveness of their products. One of the goals of the XR Edu Challenge was to invite dissimilar groups to bring their unique perspectives into building solutions that can have global impact within training and teaching models. It is XR EDU’s mission to work past the “wow” factor of XR tools and have data backing up findings for the effectiveness of these immersive technologies. Long term they plan to conduct longitudinal studies on XR uses in classrooms in order to test retention rates for learning. If you are an educator, designer, developer or student and would like to be connected with any of the projects or collaborate with XR EDU in the future, feel free to email and visit www.xredu.tech. A Million thanks to sponsors of XR EDU Challenge, Jo Ryall and the team at Microsoft Reactor, Unity, HTC Vive, Samsung and ImmersED2018.